« PureFood Probiotic Plant Protein Powder Review + a Giveaway of a Full-Size 1.2 lb PureFood Package! Every now and then I get asked to recommend my favorite vegan cookbooks. For someone who just switched to the vegan or plant-based diet, owning a useful and dependable vegan cookbook (or five) can make or break the whole deal with this new dietary choice. Of course, I know that being vegan goes beyond just what we put on our plate (I hear ya, ethical vegans! ), but since food still remains the most frequently used tool on the way to a cruelty-free world, today I’d like to focus on vegan food, and particularly cooking it with the help of useful vegan cookbooks. Do I use this cookbook a lot? Does this book call for everyday, easy-to-find ingredients? Are the recipes oil-free, or can they be made oil-free? Have I used this book for a while (at least a few weeks of heavy rotation)? In my attempt not to go overly nerdy here (or is it too late? 😉 ), I’ve saved you from detailed answers to each of these questions about each book, and instead did a quick summary of all these aspects. The Happy Herbivore Cookbook is one of the first vegan cookbooks I’ve ever bought, and the one I still have in heavy rotation in my kitchen. All of Lindsay’s recipes are oil-free, with majority of them being low-fat without compromising the flavor. Most of the ingredients can be easily found in any grocery store – probably my favorite thing about all of Lindsay’s books. The Happy Herbivore is a great book for those of us who are new to the plant-based diet, or looking to cut down on oil usage in their vegan cooking. In addition to recipes for just about any occasion, there’s also a nice selection of Thanksgiving-themed recipes which made my life much easier the first year Rob and I celebrated Thanksgiving as vegans. Chocolate Zucchini Muffins – one of Rob’s favorite pastries ever! Cheater Pad Thai – called so because of the use of peanut butter, which is not a low-fat food but makes the sauce for the pad thai delicious and quick. Hippie Loaf – my go-to veggie ‘meatloaf’ that I was glad to discover after trying countless other vegan loaf recipes that either took forever to make, or made me run to the store like a professional sprinter for ingredients I didn’t have. Portobello Steaks, a.k.a. sautéed giant mushroom caps – a delicious low-calorie substitute for that piece of steak you used to have as a centerpiece on your plate before going vegan. Ease of Use: 5 out of 5. The book is arranged by chapters that make a lot of sense, like Breakfast & Brunch, Muffins & Breads, Soups, Burgers, One-Pot Dinners, etc. Plus, there’s a useful alphabetical index at the end – the indexes in some cookbooks are pretty terrible, but this one makes plenty of sense. 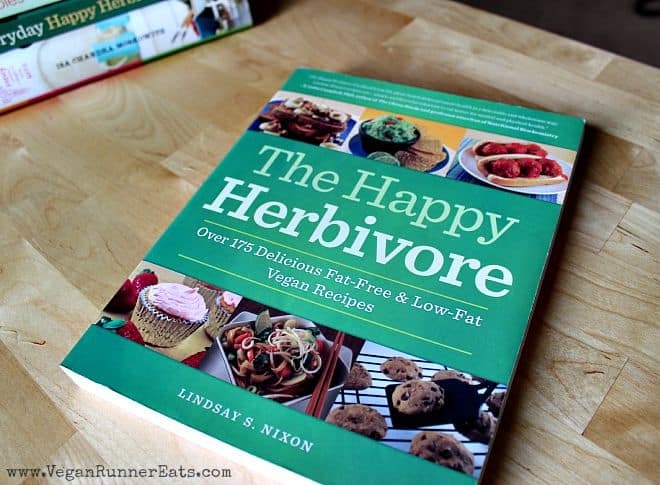 Everyday Happy Herbivore is the second book by Lindsay S. Nixon that made my list, and the second book she’s ever published. This time, the emphasis was made on quick meals that can be prepared in 30 minutes or less. I’ve never timed myself when cooking something from this book, but generally that’s about right. Once again, no oil is used in any recipes. My favorite part about this book is even better structure: some of the chapters are even more specific (like Burgers), and each chapter has plenty of good recipes. After this book, Lindsay and her publishing company changed the layout of her following cookbooks, and even though I own two more of them, I find myself using them way less often than her first two books. Most of the veggie burgers from the Burgers chapter. Tofu ‘Crab’ Cakes – so closely resembling the real thing that it’s kind of eerie. Cauliflower Manchurian – an unusual but oh-so-good Asian-inspired side dish that helped Rob get an appreciation for cauliflower for the first time in his life. Dark Chocolate Pancakes – a big weekend staple in our house! Ease of Use: 5 out of 5. The book is well-structured, with easy-to-find recipes thanks to a good list of contents in the beginning and a useful appendix at the end. Once again, I kind of wish Lindsay went on with this format with the rest of her books, but my heart isn’t overly broken here. Vegan Casseroles is my ultimate go-to source for vegan comfort food. When Julie’s cookbook came out last year, I read lots of raving reviews from various vegan bloggers, so I was very excited to get my own copy. I reviewed this book in detail in this post and even shared three recipes with Julie’s permission. It may be the middle of the summer right now, but I still dive into this book every now and then to make a delicious and comforting casserole or two. The recipes here aren’t low-fat or oil-free, but I’ve had success cutting out oil in many recipes. For example, it’s easy to replace oil with veggie broth or water when sautéing onions and garlic. As for the decadent things like nut-based cream sauces, let’s face it: even though they are full-fat, it’s most likely that they are still healthier than cream/butter/egg-based (and thus full of cholesterol) sauces of traditional casseroles. Cajun Jambalaya with added Field Roast sausages (my addition, the original recipes doesn’t call for those). Black Bean, Zucchini and Corn Enchiladas with a delicious homemade enchilada sauce. Spinach Florentine pasta for when I’m craving something particularly decadent. Bumbleberry Pie – the taste of summer any time of the year! Ease of Use: 4 out of 5. The fifth point is taken out because the list of contents in the beginning of the book mentions all of the main chapters but doesn’t list each recipe within that chapter. To find what you’re looking for, you need to go to your chosen chapter inside the book, and see a list of recipes over there. This structure doesn’t complicate things too much, but it still adds an extra step to your search. 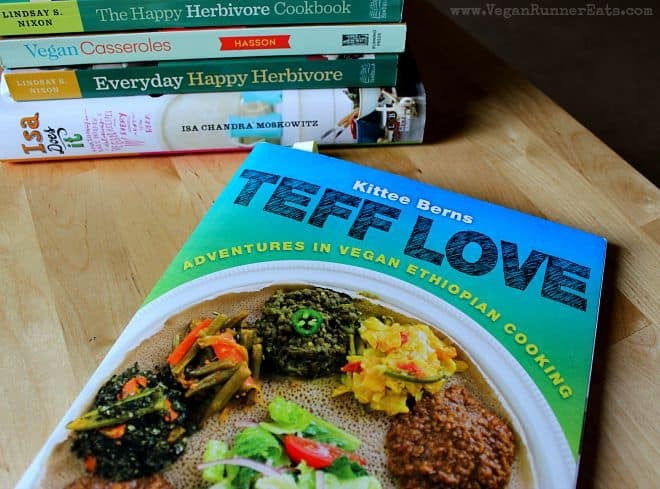 Teff Love is the result of Kittee’s lifetime fascination with Ethiopian cuisine that she nurtured while having lived in three very different parts of the US – Washington, DC; New Orleans, Louisiana; and Portland, Oregon. I wrote about how Kittee personally (although not in person) introduced me to Ethiopian food, and reviewed her cookbook in detail in this post (there’s also a little interview I did with her!). By now I’ve developed my own list of favorite recipes from Teff Love for times when that special craving hits, but every time I open the book, I find more and more interesting recipes to try. Ethiopian cooking can be as simple or as complicated as you want it to be. You already know and love the majority of ingredients each recipe calls for: simple vegetables like potatoes, cabbage, carrots, onions, green beans, tomatoes, etc. Things get a bit more specific when it comes to the spices used, but as Kittee advises, even if you can’t find some of the more exotic spices, it’s fine to omit them. The dish may taste a bit different than its original version, but it will still be tasty. The same thing applies to oil: most recipes call for it, but I’ve had success making lots of stews in the book oil-free. Hands-down, the traditional Ethiopian injera bread is quite spectacular, and Kittee provides very detailed instructions on how to make it. Ye’Misser Wot Be’Timatim – a spicy red lentil stew that frequently appears at our Ethiopian feasts at home. Hirut’s Fasolia – a green bean and carrot side dish in a tomato-ginger sauce that finally had my husband start eating green beans. A couple not-so-traditional favorites – the Ethiopian Mac’n’Cheesie that’s become my family’s go-to vegan mac’n’cheese recipe, and Blueberry-Cinnamon Pancakes that use a little bit of injera bread sourdough starter – the most comforting pancakes ever! Ease of Use: 3 out of 5. There is a similar contents list arrangement as in Vegan Casseroles above, only the opening page for each chapter inside the book doesn’t have a list of its recipes, which makes it hard to find that one particular recipe you may be looking for. Things get easier the more you use the book, but this is the reason a lot of really great recipes can end up overseen for a while. 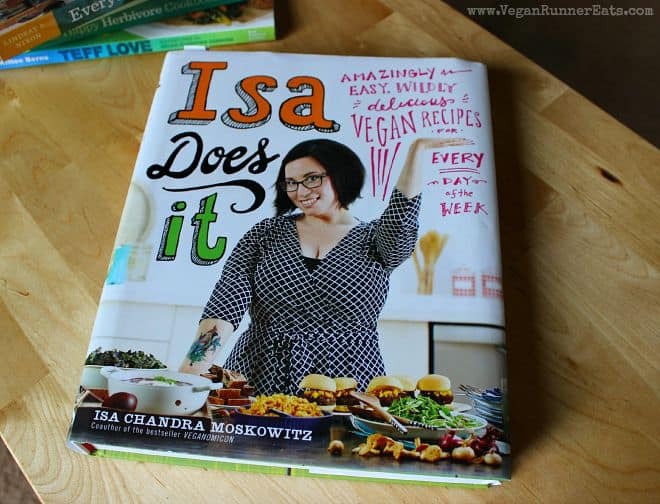 Isa Does It is one of the latest additions to my vegan cookbook library, even though the book was released in 2013. As soon as I opened this cookbook, I was taken away by the beautiful food photography, a variety of interesting fonts, and Isa’s little ‘stories’ about each recipe. Right away I dove into exploring the recipes, and for two or three weeks this was the only vegan cookbook I cooked from. Believe it or not, every recipe was a hit both with me and Rob, and I yet have to find a recipe that we didn’t like (not that I’m actively looking for that 🙂 ). Isa Chandra has authored a number of other cookbooks, but what attracted me to this one was the the usage of simple ingredients and a 30 minutes or less of preparation time for most recipes. Ingredients-wise, the book keeps its promise: you’ll be fine as long as you’ve stocked up on raw cashews, tofu, canned chickpeas and tahini in addition to the common vegetables, grains and flours. As for the time, I found that it usually takes me longer than half an hour to make most recipes, but I’m known to be slower and very thorough with things, so maybe it’s just my experience. A lot of recipes are quite decadent – cashew cream is used a lot, and most recipes call for oil, which I once again was able to omit quite often. Favorite Recipes: Where do I even start? Coconut Chana Saag – the Indian-inspired stew with chickpeas and kale in a tomato-infused coconut sauce that tastes like a dish from a sophisticated ethnic restaurant. Tofu Mushroom Stroganoff – this comforting pasta dish was a big hit with my non-vegan parents while they were visiting me for a few weeks recently. Moroccan Harira – a delicious soup with chickpeas, eggplant and thin pasta in a tomato-based broth that my parents also loved. Korean BBQ Portobello Burger with kimchi that tastes like I’ve cracked the code of deliciousness! Ease of Use: 4 out of 5. 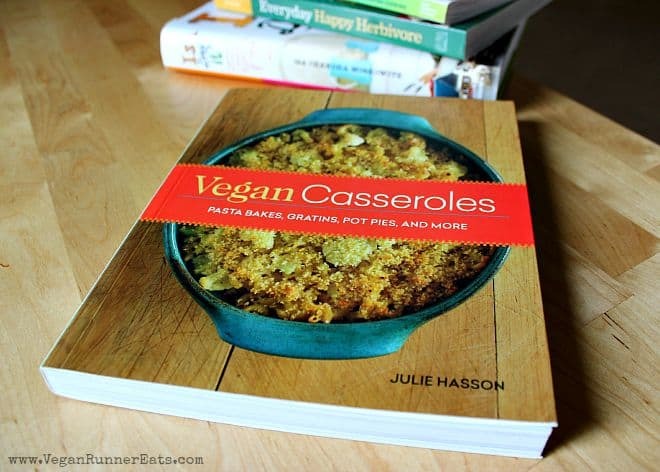 The book has a similar setup as Vegan Casseroles above, with a main chapter menu in the beginning, and a list of each recipe within those chapters in each individual chapter opening. Somehow still, I find it quite easy to find the recipes I need because by now I’ve memorized the order the chapters are arranged in. So if I’m looking for a stew and open the book at the sandwich chapter (a.k.a. Handheld), I know that I need to search a couple chapters over. Overall, Isa Does It has good usability for my picky taste. What’s your favorite vegan cookbook that you use over and over? What are your favorite recipes from that cookbook? Please let us all know below in the comments! Also, just a heads-up: it may be another 2-3 weeks before a new post here on the blog because Rob and I are going on a long-awaited vacation next week – yaaay!!! – and then we’ll be hosting his parents for a few days. Naturally, the opportunities for quality blogging will be sparse, but please bear with me! Disclaimer: None of the above mentioned cookbook authors or their publishers have paid me to write this post, although I did receive Julie Hasson’s Vegan Casseroles and Kittee Berns’ Teff Love for free back in the day in exchange for a review. All opinions are my own, and thus 100% genuine. 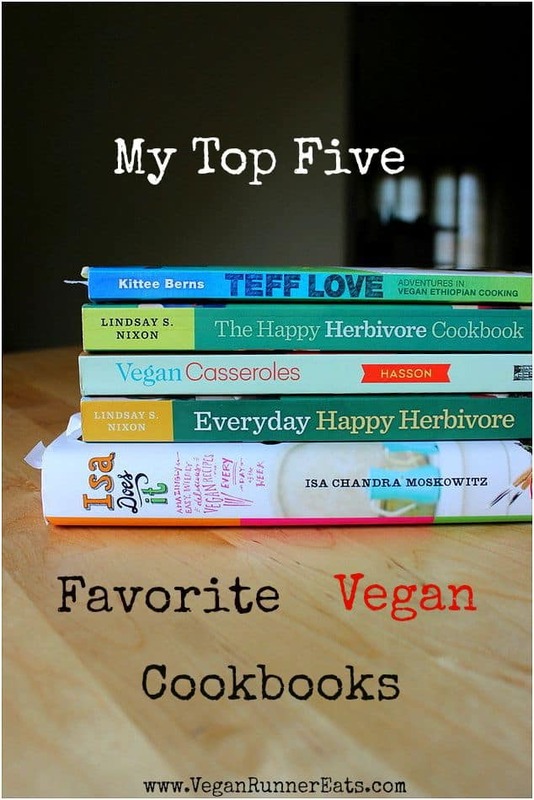 Tagged Happy Herbivore, Isa Chandra Moskowitz, Lindsay S. Nixon, Teff Love, Vegan Casseroles, vegan cookbooks. Bookmark the permalink. My all time favorite vegan cookbook is The Great Vegan Bean Book by Kathy Hester. I use it once or twice a week. My favorite recipes include: Beluga Lentil Borscht, Cornbread-topped Casserole, Beluga Lentil Stew over fresh spinach, and Triple Lentil Soup with wheat berries (I use quinoa instead.) Most of the recipes have and oil-free option. My next favorite cookbook is Eat Right, Live Longer by Neal Barnard. I make the cornbread, rice pudding, and shepherd pie most often. I also use Veganomicon by Moskowitz and Romero. I adjust the recipes to use no oil. I love the roasted portobellos (although, I tweak it quite a bit) and the lemony roasted potatoes. I have just begun to use The Happy Herbivore cookbooks. The mayo recipe is wonderful! I used it to make potato salad this week. We have been having a lot of salads because it has been very hot in the SF Bay Area. Most of my favorite recipes come from you and Susan Voisin online. Thank you for stopping by, Sandy, and thank you for the nice words about my recipes 🙂 You’ve reminded me of The Great Vegan Bean Book – I used to cook a lot from it when I first got it, but it’s been covering dust on my bookshelf lately for some reason. The Chocolate Pea-Nut Butter Pie from that book is Rob’s all-time favorite vegan pie! And the chocolate chip-chickpea cookies are also great! I like Lindsay nixon’s cookbooks, too along with Jo Stepaniak’s (Vegan Vittles, Table for Two, The Ultimate Uncheese Cookbook) and Jennifer Raymond’s The Peaceful Palatte and Fat-Free abd Easy. Awesome, Kathy! I need to look up those last two authors you’ve mentioned. I have quite a few vegan cookbooks, but I haven’t tried any of these cookbooks yet! They all look interesting to me. I have never tried Ethiopian food, so I think that would be first on my list. I highly recommend that book, Kari – it has lots of plant-based recipes that have become staples in my kitchen!